4/22 Cup of Coffee: A pair of long winning streaks came to an end as both Pawtucket and Salem were shut down on Thursday. The PawSox failed to get any extra-base hits while Salem's big bats were also largely held in check. Josh Ockimey provided one of the few highlights on the day in a Greenville loss. The PawSox were limited to just five singles and grounded into three double plays, getting shut down by the Twins' top pitching prospect, Jose Berrios. Pawtucket was no-hit through five innings. Brian Johnson struggled with his command, allowing five walks in five innings pitched, but was only charged with one earned run. He gave up just three hits and struck out five, but the walks contributed to his night ending after five innings of work. Pat Light surrendered his second home run of the season in 1 2/3 innings of work. Blake Swihart continued to struggle since his demotion, going 0 for 3 and dropping his average to .143 through five games for the PawSox. Salem was also stymied at the plate, bringing its hot streak to an end. Catcher Ben Moore provided one of the few positives for Salem, going 3 for 4 with a solo home run out of the eighth spot in the lineup. Andrew Benintendi added a double with a run scored. Nick Longhi had a pair of hits and Yoan Moncada went 1 for 3 with a walk. Ben Taylor was roughed up for six runs on ten hits in four innings of work. Taylor Grover stopped the bleeding with three innings of scoreless relief, tallying three strikeouts and a walk along the way. Yankory Pimentel surrendered his first run of the season in two innings of work out of the bullpen but struck out three. A fourth inning of relief proved to be too much for Austin Glorius, as Columbia jumped on him for five runs in the ninth inning to hand him the loss. He had been stellar to that point, allowing just one hit and striking out four in the sixth through eighth. Greenville had rallied from three runs down in the seventh thanks in part to a two-run throwing error. 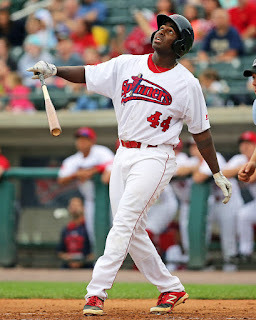 Josh Ockimey reached base four times, going 3 for 4 with a walk, a solo home run and two RBI. Kyri Washington belted a three-run home run and Joseph Monge had a pair of doubles. Starting pitcher Daniel Gonzalez was torched for eight runs on 13 hits in five innings of work. Player of the Night: Josh Ockimey's three-hit night was the easy choice for a standout performance on a day with very few of them. The 2014 fifth-round draft pick already has four home runs in 13 games, matching his total across 56 games for Lowell last season. He raised his batting average to .314 on the season.